Although the iPod nano is no longer Apple’s best selling iPod, Apple didn’t hold back with this latest refresh. 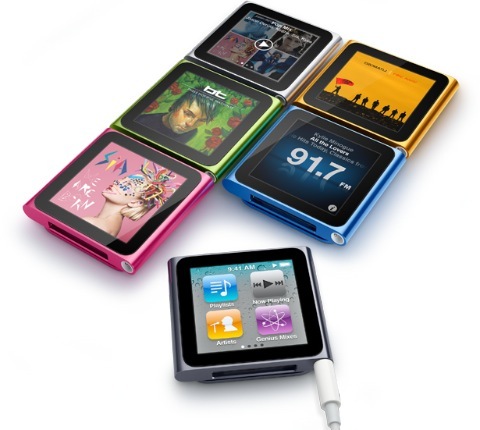 The new iPod nano sports a brand new design with a 1.7-inch multi-touch display and a clip on its back. The new iPod nano has a new user interface that will be familiar to those who’ve used an iOS device. It doesn’t actually run iOS, but Apple has certainly done a good job emulating the iOS ascetic on the old embedded iPod OS. The home screens display four icons each and are arrangeable, just as you would on an iOS device, simply tap and hold until the icons jiggle, drag them around until they’re ordered as you’d like, and press the lock button to lock them in. Tap and hold on most screens brings you to the home screen. Single tapping on the album covering in the now playing screen brings up your audio controls and there are VoiceOver commands if you’d rather tell your device what to do. The iPad nano’s screen can be rotated to any orientation, just use two fingers to rotate it. There’s no home screen button and no lock screen, instead just a single lock/power button and two volume buttons along the top. The 30-pin dock connector is still there and yet they’ve managed to shrink the device to nearly half the previous generation’s size and weight. Apple has done away with video support. No more video camera or video playback of any kind. This may just be a way of pushing customers toward the more expensive iPod touch but I doubt most iPod nano owners ever watched video on their device anyway. The nano does still have FM radio support which was a big selling point of the previous generation. There’s Nike+ support and even a pedometer to keep track of your steps. This revision to the iPod nano is clearly about simplifying the device and brings the nano back to its core feature-set. Music is its primary function and you can see that with every decision Apple made. Apple did a great job with this update and I think the new form factor was well worth the loss of features. For the kind of buyer who would have purchased an iPod nano before, this refresh will only give them more reasons to make the purchase. The iPod nano is priced at $149 for 8GB and $179 for 16GB. It’s available in seven colors and is available for pre-order today.